A fortnight ago our blog looked at all the branding associated with the Wimbledon tennis extravaganza. But, it’s not just trade marks that get a look in when it comes to sporting events. A lot has happened to the technology since Spencer Gore won the first gentlemen’s single title back in 1877. Today’s competition contains all manner of gadgetry and innovation to give the viewers, players and umpires the means to get closer to the action. 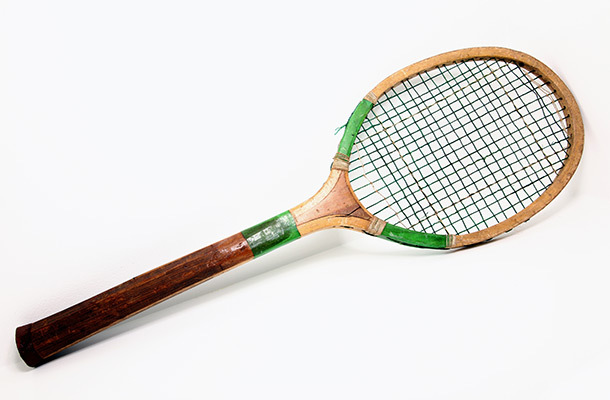 Originally made from wood the tennis racket has changed from its humble beginnings to a piece of precision equipment. Now made from a variety of carbon composites incorporating shock and vibration absorbing elements. There have been many patents relating to the development of the tennis racket. The first major breakthrough was the introduction of the metal rackets in the 1960s although metal rackets were patented as early as 1925. Today’s rackets are stronger, lighter and have a larger surface area than those of yesteryear helping even the amateur player look proficient. Image licensed by Ingram Image. The first rackets used sheep gut, (not cat gut although commonly referred to as catgut) because of its flexibility, elasticity and retention of tension. However, due to the relatively high cost of natural strings and its lack of durability, manufacturers have constantly looked for other options. Synthetic strings made from Nylon, Polyester and Kevlar or combinations of these are now popular, offering a cheaper and reliable alternative. Some of you may be old enough to remember the late 70s and early 80s and John McEnroe’s on court outbursts, berating the umpire for an incorrect decision, a dodgy line call or just because he wasn’t playing well. Help is now at hand for the umpire. Introduced in 2007, the Hawk-Eye ball-tracking technology system is now an integral part of most tennis competitions. When the result of a match can depend on the thickness of a white painted line, the system is able to display the outcome of any bounce within 5 seconds of the ball landing. The result is then displayed to the players, umpire, fans and television viewers simultaneously. Originally Charles Goodyear invented the original tennis ball in the 1850s. It was made from rubber using the vulcanisation process and was black or white ball. It was replaced by today’s recognisable yellow version in 1972. This was mainly for television purposes as research had shown them to be more visible to viewers. The modern tennis ball is made from two separate 'half-shells' which are assembled together to produce a 'core'. The original flannel cloth was replaced by special 'melton' cloth. This was made specifically for the purpose and the stitching has been replaced by a vulcanised rubber seam. 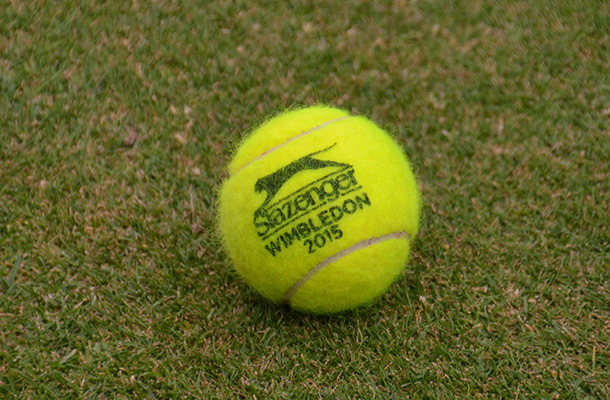 Wimbledon did not actually adopt the yellow ball until 1986. Maintaining the iconic grass playing surfaces is crucial to Wimbledon’s success. Cut to a precise measurement of 10 millimetres each day, an attractive blend of perennial ryegrass is used. Attractive that is, to another of London’s iconic residents, the pigeon. In this case however, no breakthrough technology is used, but a traditional secret weapon, in the form of a Harris Hawk. Rufus a male Harris Hawk is used to scare away any unwanted feathered visitors. Just a glimpse of his 40inch wingspan is enough to scare any pigeon back to Trafalgar square. but I’ll take a guess that Andy Murray is still there. Come on Andy!